I give all the following books a 5 star recommendation! The Healthy Pregnancy Book by Dr. William (and Martha) Sears is full of great information! This book has a little bit of everything. It covers all the topics from finding the right health care provider to how to sleep better, eat better, manage stress, and ultimately - how to have a healthier baby and birth! I have this book in my lending library, but let me tell you now -- you need your own copy! You can always give it to a pregnant friend later, (if you can stand to part with it)! Although I have the older version of this book in my lending library, this revised edition has an easier to read format, and is more up to date in the research department. Forget that book everyone tells you they have read (hmm- something about what to expect....:-) -- this is the one book with evidenced-based research, and should be your go-to pregnancy and birth resource! 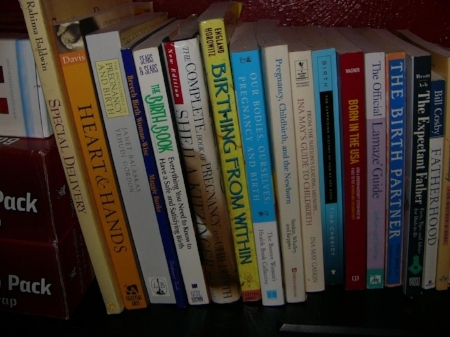 It covers information from pregnancy to newborn care and will compliment any other books you might want to read. Be empowered, be informed, and enjoy this book! All that being said, Ina May has a lot of good information to say, and she has many books to say them in. This book is one of the easiest to read, and enjoyed by most everyone! The book starts out with birth stories and continues on about birth, birth practices and safety. Ina May has a way of taking the fear out of childbirth and portraying it as it should be -- a happy, and healthy, normal event. by Pam England CNM MA and Rob Horowitz Ph.D. Okay, I will admit, there are some parts of this book I can't swallow hook, line and sinker, but there is still some great information in a very easy-to-read-format. If you aren't into the art projects that are supposed to help you overcome birth fears, and if the new-age, hippy parts of the book leave a bad taste in your mouth, you can skip to chapter 16 and get some great information on how to cope with labor and birth. There's something for everyone in this book! Henci Goer wrote her first book, Obstetric Myths Versus Research Realities, in 1995 and it has become a staple for childbirth professionals since. Its successor, Optimal Care in Childbirth: The Case for a Physiologic Approach, written in 2013 -- won the American College of Nurse-Midwives “Best Book of the Year” award. The Thinking Woman's Guide to a Better Birth is loved by birth professionals and parents alike. It explains all the common birth procedures along with their risks and benefits, so it will definitely provide you with all the information you need to build an informed and educated birth plan! Some of the information is slightly outdated, and that is why I cannot stress enough that you should always take a well rounded childbirth class. That being said, this is still probably my most recommended and borrowed book in my library. Ahhhh...Marsden Wagner. What can I say? I love him. Not in a "I-want-to-marry-you" kinda way, but I just love to hear him talk. I love his passion. Some people cannot stand his somewhat, crass, opinionated manor, and his undoubted bias for natural birth, but maybe that is why I love him! Dr. Marsden was a perinatologist and perinatal epidemiologist and was also the Regional Officer for Maternal and Child Health in the European Regional office of the World Health Organization for 15 years. He knows medical birth and he knows natural birth. He knows how births take place in the hospital and how women give birth at home and in birth centers -- and he makes no bones about which he prefers for low-risk women. This book isn't for everyone, especially if you aren't already aware of birth politics and practices we have here in the US. However, if you tend to be a wee bit cynical, or even have an open mind to the birth crisis we have in America -- and want to make a truly informed birth plan -- read this book! This is one of my personal favorites, but it's not for everyone :-) This is another book I have available in my lending library. Here was the last interview Dr. Wagner did back in 2008 https://www.youtube.com/watch?v=Cm8ErQxTFyo. May his soul rest in peace. I read this book during my breastfeeding counselor training, and it was super informative. Dr. Jack Newman is probably the number one expert in the breastfeeding business. Don't ask me how a guy got to know so much about breastfeeding! It's not because he is a pediatrician, because unfortunately most do NOT know much about breastfeeding at all. Maybe it's because he was a father of four breastfed children, but I think it most likely has to do with the fact he has been helping mothers breastfeed for 30-some years. This book is a classic! Published first in the 1950's this book is now on it's 8th revision, and going strong. It continues to be a number one seller, and has been read by thousands (if not millions) of women! This book is huge (about a hundred more pages than Dr. Jack Newmans book) -- but you don't have to read it cover to cover. Read what you need! Some people are put off by this book claiming it is too judgmental. (It does talk about the benefits of getting the best start by having an unmedicated birth, and it also talks about how going back to work is hard on brestfeeding moms) -- but this book is too good to throw out the baby with the bathwater in my opinion. When I had to read what seemed like a hundred books about breastfeeding, during my breastfeeding counselor training, I can tell you I was not looking forward to yet another book! I had read everything from clinical to breastfeeding politics, and I was pretty sure I was going to have trouble staying awake reading the same information yet again. I was pleasantly surprised and instantly captivated by this book! Janet Tamaro was funny, and she was up-to-date! I recommend starting with this book and then adding one of the two other books listed above for more in depth trouble shooting and information. Sometimes it helps to get the same information in a different way, but this book will not be as detailed on the how-to's. Get one of each, take a good breastfeeding class, and get ready to breastfeed! This is a huge book, and if you only buy one book on babies, this should cover it all for ya! My sister likes to call it the 'baby bible', and she loves to give this book out as a gift to pregnant friends and family. You'll see why...it's huge! It has information on everything! You obviously don't have to read this book from start to finish -- just read up on the information that you need in the moment. Not everything in this book is going to work on your parenting journey, and you may readthings you do not agree with. Some of the advice might even offend some people (attachment parenting, co-sleeping etc). Personally, I have no problem reading through and taking various pieces of advice and adapting it to my own needs, and you can too :-) Even Dr. Sears and his wife talk about how you have to do what is right for your family. This book is still a treasure! There is so much information that is helpful and dare I say necessary to have as a reference -- like how to take a temperature, or ways to get the medicine down that makes it worth every penny. Trust me, you'll wear the cover off this one if you give it half a chance! I loved this book so much that I became a Happiest Baby on the Block educator :-) If you want to understand why babies cry, and how to get them to stop crying in seconds, you might want to pick this one up. Dr. Karp has found there IS a remedy for colic and it works for every baby unless there is a medical condition for their crying. Some books will provide information that works for one baby, while a completely different book only works for a different baby. That's why we have so many parents saying "well this worked for me," while another mom is frowning in frustration because that didn't work for her baby! The Happiest Baby will work for everyone, and the solutions are so simple that they are really just techniques done for centuries but sometimes suppressed or forgotten by our modern day society. If you don't want to read the whole thing, that's okay, my Happiest Baby Class will give you the "cliff notes" -- and also receive a parent kit that includes a DVD and Soothing Sounds CD. You'll be ready to proclaim that you are the proud parents of the "Happiest Baby on the Block!" Shameful confession here: I've never read this book! So I guess in all fairness I can't give it five stars just yet. I have read bits and pieces while sitting in the library, and what I did read, was awesome! Pushed is more of a political birth book, so it's not going to cover things like stages of labor and things of that nature. This book is about the sorry state of birth in the United States and her research will show the reader how the over-use of technology isn't always best, and tries to shine light on the question "do women have the right to normal birth?" Is the obstetric community letting mothers who are low risk have a normal birth? Do we even know what normal is anymore? I digress. Read this book, and you might understand that birth isn't what you think it is in the land of the free. Okay, if you don't think you can take Dr. Wagner's book on birth planning, then definitely don't pick up this book. He takes cynical to a whole new level :-) This quote really says it best: "*Starred Review* The outspoken former director of Women's and Children's Health at the World Health Organization believes maternity and perinatal care in the U.S. are seriously flawed. To make the point, he cites recent Centers for Disease Control findings that 28 countries have lower maternity-mortality rates; 41, lower infant-mortality rates. This despite the fact that the U.S. spends twice as much or more per capita on health care than any other industrialized nation. Wagner places responsibility squarely on the shoulders of obstetricians and the lobbying power of the American College of Obstetricians and Gynecologists. Interested in one thing above all else--maintaining control of a lucrative market--that group, he avers, foists unnecessary, expensive, and invasive medical interventions upon women when none are needed. Obstetricians are only necessary, he says, in a minority of cases in which serious medical problems threaten the life of mother or child. For the most part, childbirth isn't a medical condition, and infant and maternal mortality rates are lowest in countries in which midwives attend to it. Speaking from his experience as a clinical perinatologist and a perinatal epidemiologist and supplemented by the hoard of credible sources cited in the copious endnotes, Wagner pulls no punches in advocating a woman's right to control the entire reproductive process, from conception through birth." Donna Chavez Copyright © American Library Association. All rights reserved --This text refers to an out of print or unavailable edition of this title. This book really breaks down the tough decisions about vaccinations. This book is fairly easy to read and Dr. Robert Sears does agreat job of telling you about a particular disease, how common it is, how dangerous (or harmless) it is, and then goes on to cover the vaccination ... from the ingredients of the vaccine, to any possible side effects from the vaccine. The information is presented in an unbiased manner, so you can decide what vaccinations you want for your child and when to get them. Another book I'll admit I have not read, but when I saw these videos, I knew I wanted to read the book. It's definitely on my wishlist!